This post is a few days late, but we finished our Whole30 a week ago! This past week, we just kept going, not starting our Reintroduction phase until today. Oddly, by week four, we felt we were simply cruising. Meals were planned but not so meticulously - it felt natural to cook and eat this way, so it didn't take so much careful attention to every step in order to keep to the plan. It also meant less careful following of specific recipes, rather than just putting together a good meal. Breakfast & Lunches continued to be put together from dinner leftovers and what we kept on hand, following the Whole30 template (protein, sufficient good fat for satiety, and filling the plate with veggies and fruit). We did get lax about pre-prepping fast breakfast items, like homemade sausage and egg muffins or frittatas, and putting together soups for portable lunches, and found their absence to be annoying, so we'll pick back up again with that level of pre-preparation. The Lemon Garlic Chicken Strips were simply sauteed in Ghee along with minced garlic and fresh lemon (and its zest) along with some capers to create a classic Chicken Scampi type meal. The real star was the Waldorf Slaw and I'll share that recipe with you below. Ghee was also used to top the baked Sweet Potatoes served with the ham. The Chicken Stir-Fry was simply put together with little attention paid to quantities - I used some Red Boat fish sauce, a bit of coconut aminos, some grated ginger and sesame oil and then on whim threw in a splash of orange juice, and the result was delicious. The veggies were simply onion, celery, carrots, some leftover shredded cabbage, mushrooms and a spiralized zucchini to sub in for noodles. 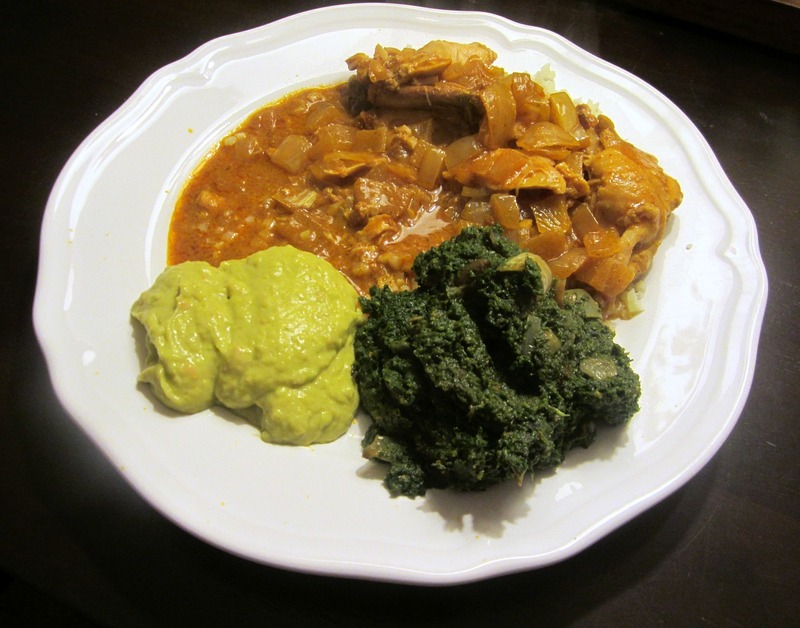 My husband handles week-end cooking and treated me to a delightful Butter Chicken, with Saag and Avocado Chutney - this shouldn't even be possible on Whole30, right?? But he found the recipes and the results were amazing! The Beef Stew was also a put together with cubed beef, potatoes, mushroom, onions and celery - I found that some Butternut Puree and tomato paste made it thick enough to feel hearty, but a little arrowroot would have also made it thicker. - a mash up of my two favorite salads! Combined all the prepared salad ingredients in a large bowl. In a small bowl, mix together dressing ingredients. Fold dressing into slaw so that all is coated. Chill until ready to serve. I mentioned the results we were experiencing at the end of Week 3 here and they continue to hold. We had take out the day after and thought everything was compliant (except for the 'psychological' no-nos. In other words, we had fries) , but I wound up having an awful night's struggle with GERD. So I need to avoid fried foods when out - it's pretty clear that the oil they use is not for me. But we also got to weigh and measure ourselves! On Whole30, there is no peeking at either scale or tape measure, because part of what it is going to do is teach you to pay attention to clues about mood, physical well-being, alertness, skin health and yes, pants fitting more comfortably. We knew the numbers would be good - but we were curious to know by how much. We'd done our measurements before we began, and here's where we landed a month later. I do believe a good bit of my loss was due in no small part to the loss of systemic chronic inflammation, so I'm ready for these results to slow down going forward. WOW! I had low, low expectations for that part - the last time I did this, the results were far less profound. We've decided to primarily continue eating this way, with occasional easing up for special occasions. It's working for us and the food is, simply put, delicious! But first, the Reintroduction! 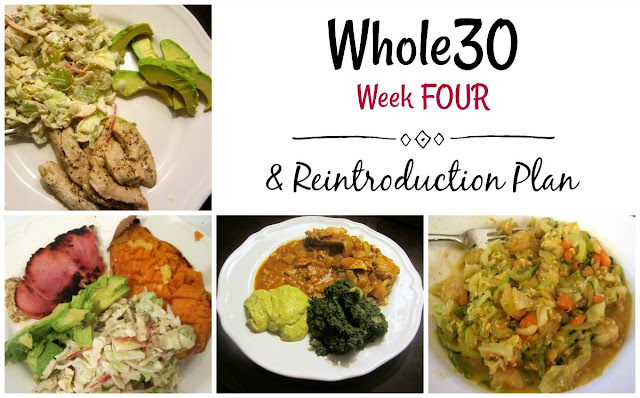 The second phase of Whole30 involves a methodical reintroduction of the foods that were removed for 30 days (minus those you just don't want back in your life - for me, that's junk food and highly processed glop). Over this next month, we'll be having days where one category of food is eaten (while otherwise keeping to Whole30 rules) and then a few days back to a strict Whole30 while paying attention to effects. How long between depends on what happens -standard is 2 Whole30 days after each reintroduction, but I was experiencing so many inflammatory effects before we began that it may take me longer than that to clear up before the next test day. The categories we're specifically testing for include a little modification from the recommendation. I wanted to look at sugars, in particular, as I have suspected it is having a bad effect on my GERD. I plan to avoid cane sugar as a practice, but want to know if alternate forms carry a similar reaction (in any event, added sugars can only be an occasional thing, as all sugars cause issues of their own, and it is highly addictive. Sugars - honey, maple, coconut sugar. We both dislike stevia, agave and the like, so no point in testing those. Alcohol - (timed around a social event that's coming up) - Wine, cider and/or non-gluten liquor. Non-Gluten Grains - oats, rice, quinoa, corn. If this day gives me fits, i'll be breaking these out to individual tests once the main reintro is done. Gluten Grains - wheat, barley, etc. Bread, flour tortillas, pasta, etc. I know this is going to cause me grief, so I consider this my inoculation against any further temptation to start eating this again. Yes I love it. But I love not feeling sick all the time more. Beer - separate from the Gluten grains day, we want to test beer and see if it causes similar issues. My husband is a craft brewer and it would be sad not to ever be able to drink it! So that's the plan! If you're curious about Whole30, check out their website and consider trying it for yourself! Wow! You are both doing so good!! Thanks for sharing with SYC. 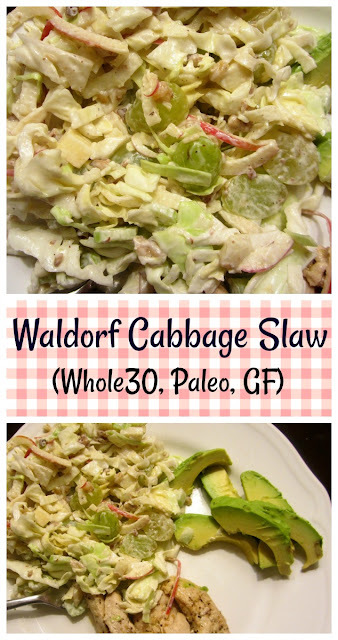 This waldorf cabbage slaw is a wonderful recipe. It sound delicious, thanks for sharing it. 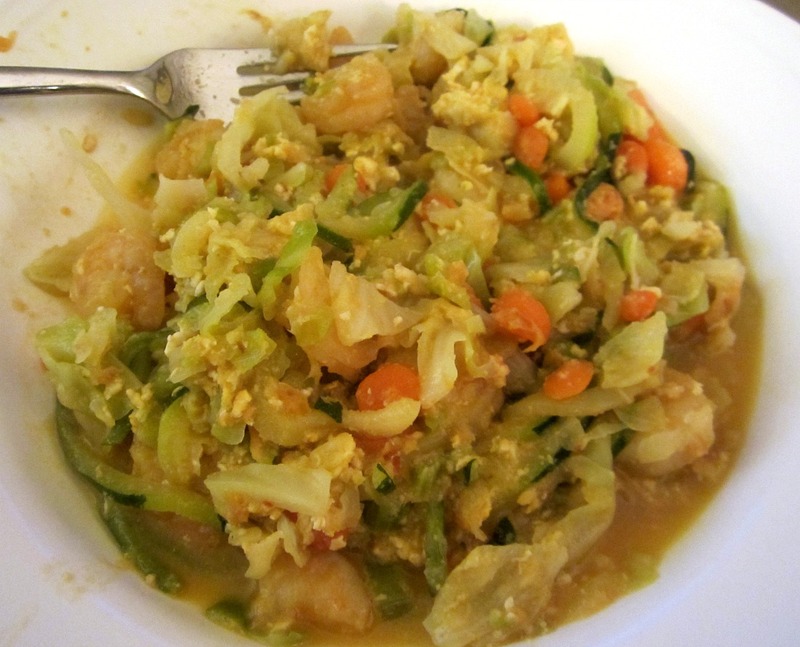 Love the sweetness added to the cabbage! Thanks for sharing with Friday Frenzy! That slaw looks awesome - looking forward to hearing your test results. 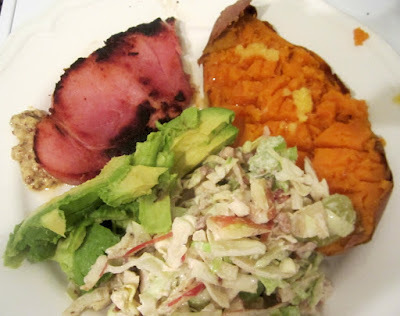 Thanks for sharing at the What's for Dinner party - have a fabulous week! I will love your Waldorf Cabbage Slaw, we will enjoy this Slaw. Hope you are having a great day and thanks so much for sharing your awesome post with us at Full Plate Thursday. This salad is one of my all time faves--seriously I could eat it at least 3X a week! Thanks for linking up to the friday frenzy--we appreciate you! It's so lovely when a healthy eating plan like Whole 30 starts to feel natural - and what fantastic results you have had! Congratulations to you and your husband, Lynda! 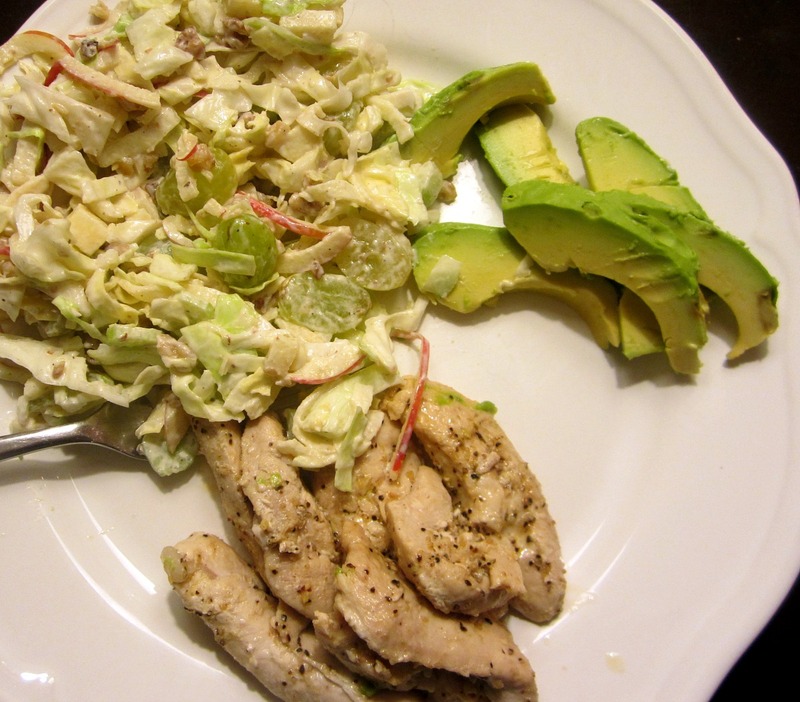 Your Waldorf Cabbage Slaw sounds really delicious too. Thank you for being a part of the Hearth and Soul Link Party. Have a lovely week ahead.